The Infinity is a beautifully executed 2-button notch tuxedo, crafted in from a luxurious heather grey 150 thread-count fabric that is just excellent. The slim satin-edge lapels are a modern touch that our customers love. Available in Modern and Slim Fit. 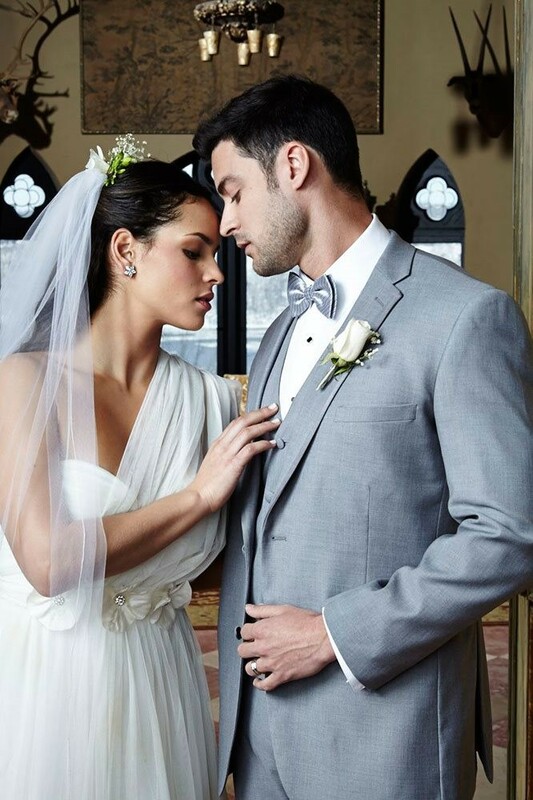 The Infinity Grey Tuxedo by Cardi, is one of the top of the line high quality tuxedo designs inspired by Vera Wang. With modern, top of the line features like its high quality fabric, and narrow notch lapels – it's quite remarkable that it comes at a much lower price than similar options from other stores. This tuxedo is crafted from high quality Super 150's Luxury Soft Fabric. It features one hundred and fifty threads per square inch, which results in a luxurious soft feel and lightweight to wear. Lower thread count tuxedo fabric feels heavier and coarser, so the difference is apparent. 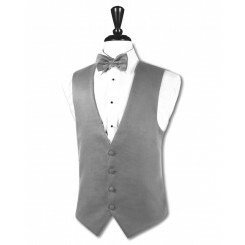 If you like grey tuxedos, you might enjoy other items from our selection of grey tuxedo products. Coat features a 2-Button Closure. 2-Button jackets are commonplace and a typical choice in modern formal fashion. Anyone can feel comfortable wearing a two button jacket to a formal occasion, it is almost always an appropriate choice for any occasion. The Infinity features modern, narrow notch lapels that are framed in a satin edge. It's a unique take on tux lapels that looks great and stands out. Something you'll only find on a high quality modern tuxedo. The jacket is single breasted, which means the jacket features buttons on the left front side only. This coat features a side vented back, sometimes called a double vent. Vents, as they're called, on a suit or tuxedo jacket serve a functional purpose. They let us sit comfortably with minimal ruffling of your jacket. There are some minimal fashion implications and the general rule of thumb regarding jacket vents is that there are no rules. Any vent style is acceptable fashion. Self-Top Collar – Top of collar is made from the same material as the jacket. The following occasions represent some of the events this tuxedo can be worn to. This grey tux can look great on a groom who wants to stand out, or on your entire wedding party! You can also view more of our wedding tuxedos. This is a great option for students who want to stand out on prom. While everyone is wearing black, you'll stop the show in this beautiful grey tux. The Cardi Collection comes from a manufacturer called Cardi International, based in the United States. Their products are known for being made from high quality materials priced at affordable rates compared to similar products. Cardi products are a great option for anyone who just wants a quality tux that they will look great in. The deal with Cardi is that you get designer quality and style, without paying designer rates. If you're interested, we offer other Cardi Tuxedos. This tuxedo is available for rental at our affordable online tuxedo store. Your tuxedo will be delivered to you up to 10 days before your event. Shipping is just $8.95 on your entire order, and your package will arrive with a pre-paid return shipping label so it costs you nothing to return. There are no late fees or any other hidden charges associated with our rental service. You pay only for your items and shipping. Our rates are affordable and generally cheaper than your typical chain rental store, while our products are equal or better in quality.